By Jennifer Bloom. 2014. Stipes Publishing. 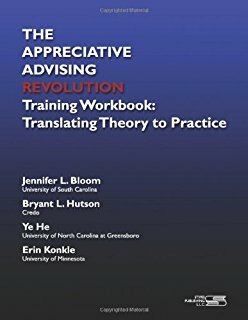 This training workbook supplements the material presented in the best-selling text, The Appreciative Advising Revolution. This workbook offers specific suggestions for implementing Appreciative Advising at the institutional level. A great starting point for creating unique professional development opportunities for faculty advisors, professional advisors and advising staff!